Blue Sky Farms began as, and remains, a family business. We started as a platform for the future, with the focus of allowing more people to work together in the same direction – everyone brings something different to the table – and to provide an opportunity for people to grow with the company. 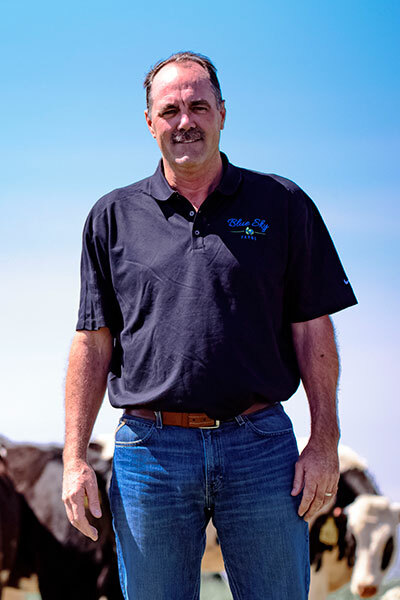 Blue Sky Farms has grown to include four dairies in Texas and one in Ohio; another location where the calves and heifers are raised; and a farm that provides feed for the cows and heifers. Just as the name implies, Blue Sky Farms represents wide open thinking and a positive outlook for the future. Harry DeWit was raised on a small farm in the Netherlands, where his family milked cows, raised hogs and grew crops. During the final year of his junior ag college, Harry was given the opportunity to complete a one-year internship on a Canadian dairy. After this internship, he was offered a herdsman position at a California dairy where he stayed for five years. In 1992, Harry moved to Stephenville in central Texas, where he leased a dairy and bought 150 cows. After leasing a dairy for 10 years, Harry and his family moved to the Texas Panhandle, bought land and built a 2,500-cow dairy. High Plains Dairy has grown over time, and currently houses about 4,600 cows in a cross-ventilated barn facility. After growing the dairy in the Texas Panhandle, the farming operation and several other partnerships, it was decided in 2013 to merge the various operations and partnerships into a single business. Harry is the CEO and president of Blue Sky Farms. Harry has been recognized as the U.S. Innovative Dairy Farmer of the Year for his progressive and forward-thinking ideas. He has implemented best practices for taking care of his cows, his land and his employees. Harry and Margret have four children: Ryan, Jake, Kim, and Cody. Josh McDonald serves as Chief Financial Officer of Blue Sky Farms. Josh has a multifaceted position, where he manages the company’s finances and its relationships with lending institutions as well as overseeing the farm operations. He is a member of the Board of Directors, and plays an active role in strategic development, implementation and evaluation. Raised on a farm in Lazbuddie, he demonstrated an entrepreneurial spirit at a young age. 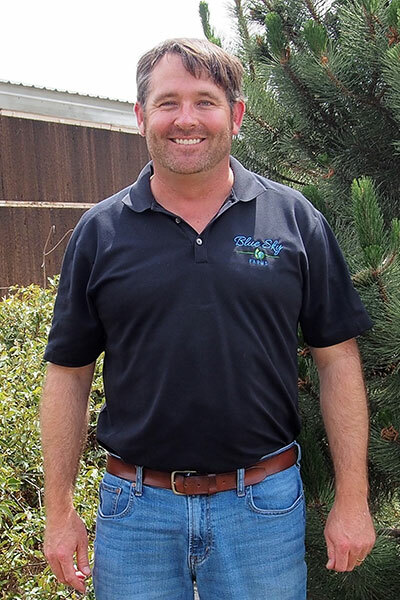 Josh started farming at the age of 15 and continued to grow the business into a respectable operation up to the time he merged it into Blue Sky Farms. Outside of Blue Sky Farms, Josh stays busy with his commercial real estate company, land acquisitions, and feeding cattle. He and his wife Kristen have two children: Aidan and Jacey. Josh holds a BBA and a master’s degree in Professional Accounting from West Texas A&M University. K.R. Averhoff is a partner in Blue Sky Farms and is part of the management team that leads the overall organization and direction of the business. In addition, he works closely with the managers at each of the locations and assists with getting new projects started and focusing on areas of opportunity. 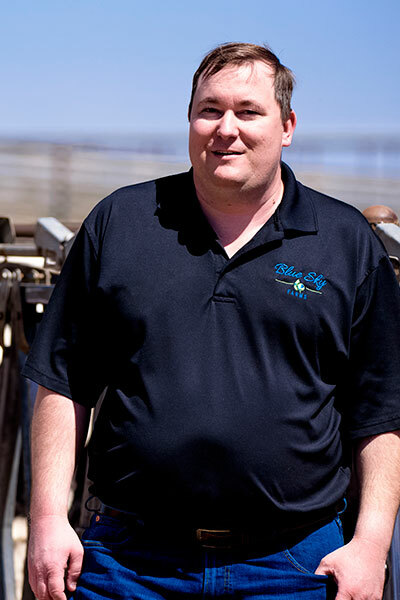 Prior to joining Blue Sky Farms, K. R. worked for Dairy Services, another entity owned by Harry and two other dairymen in the Texas panhandle where he focused his time on performance metrics, group purchases, and other dairy projects that they had for him as their businesses had grown. K. R. graduated with an Animal Science degree from Tarleton State University in 2003 and received an MBA from Texas Tech University in 2005. After college, he spent some time in the industry working for ABS Global and Monsanto Dairy Business. K. R. is currently on the committee for the High Plains Dairy Conference, part of the local dairy peer group, and has volunteered with the North American Intercollegiate Dairy Challenge. He currently lives in Shallowater, Texas with his wife, Robin and their daughter Lynlee.